Caption slip reads: "Sunday 'Smart Set'. Photographer: Rustan. Date: 1952-05-20. Reporter: Mossard. Assignment: Duquette art show at County Museum. 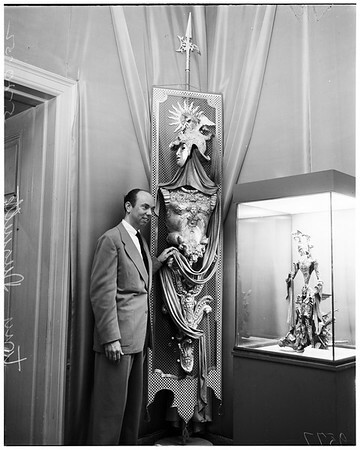 20: Tony Duquette with one of his model sculptures (in glass) and with a full scale reproduction. Close up of model sculpture (above). Tony Duquette with water color painting 'Campanile Pisa'".